There are many, many “fast food” stands in San Pedro that sell “local” foods. Almost all of them feature three ubiquitous staples – chicken, rice and beans. And I am lucky enough to have what I believe is the BEST Belizean barbeque chicken stand right near my home. 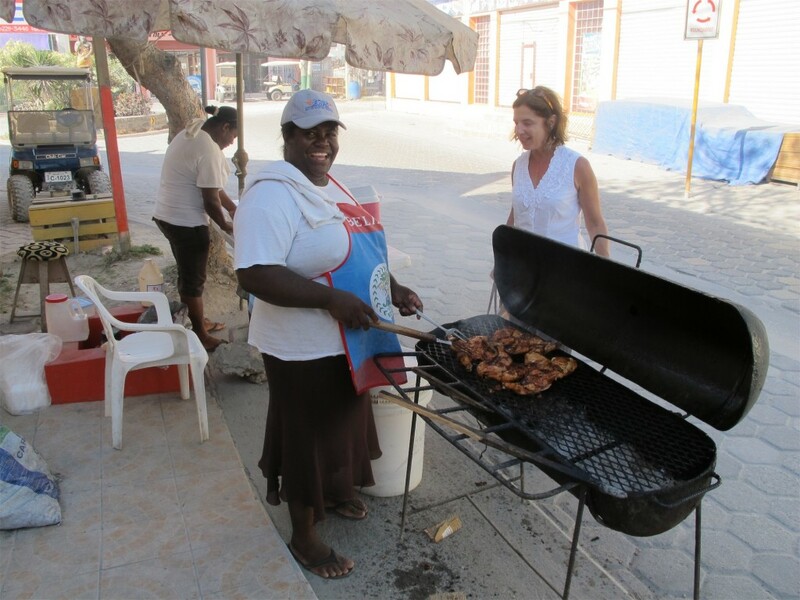 Every Sunday, a lovely local woman and her daughter set up their barbeque grill and coolers in front of the popular Belizean-owned grocery store. The sweet, smoky aroma from their cooking permeates the street and I rarely pass by without picking up some delectable chicken and beans. I order white meat (a quarter chicken) that she redips in barbeque sauce – and I choose a double order of “stewed” beans only, no rice. Flour tortillas are as large as a dinner plate and she kindly wraps them separately in a bag for me. A very filling meal for $5 USD! Watching Stephanie at the grill. During my last trip I decided to introduce myself and learn more about their little operation. Stephanie is the name of the woman who runs the show. She has five children and four grandchildren. The day I made the video that accompanies this blog, she told me she had risen early in the morning to buy 32 chickens that she quartered to make 128 pieces. Once the chicken was prepared she started on her huge, boiling pots of red kidney beans and rice and her daughter Bernice chopped countless heads of cabbage for fresh coleslaw. And of course she makes her own tortillas. She sets up around 9 am and usually sells out before 5 pm – sometimes as early as 1 pm. . 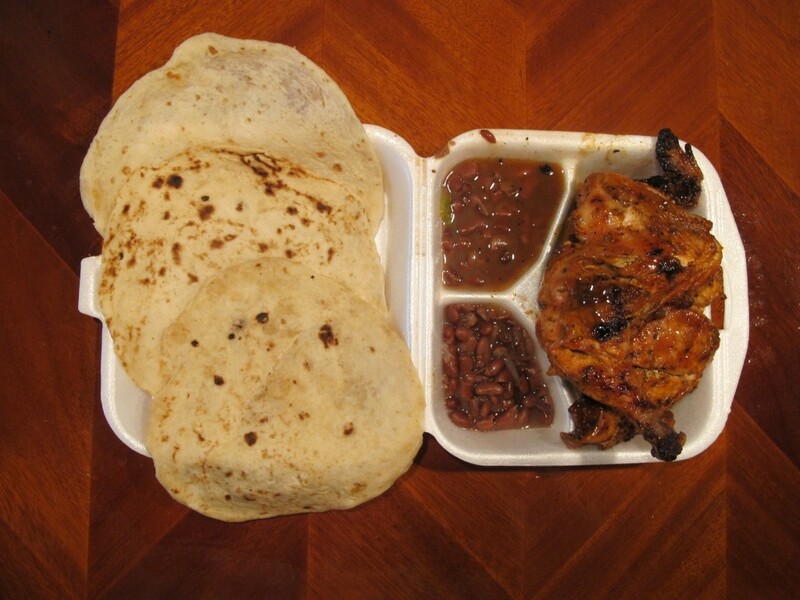 Delicious BBQ - chicken, beans & fresh tortillas. She begins the tortilla making with 10 pounds of flour, and by the time we arrived at 2 pm she was out of tortillas and had to buy more handmade ones at the grocery store. Bernice was chopping additional cabbage to replenish their morning’s cooler-full. By my estimation Stephanie had only 10 or so more orders until her grill would be empty and she could go home and rest until next Sunday. Below is my Barbeque sauce recipe that I make when I’m in Belize. I brought some to Stephanie, eager to get her opinion. She was pretty surprised that I would bother to create a homemade sauce for her, but I could tell that she was flattered nonetheless. I have changed some of the original ingredients that I use in the U.S. so that it is easy to find the components in the tiny grocery store in San Pedro. You can make it spicier with more red pepper flakes or habanero, sweeter with added honey, or less salty with less soy sauce. I am a sweet barbeque sauce fan but everyone has their individual tastes. To me a recipe is just a starting point, so make it your own. Using a medium sauce pan, heat all together for 5 minutes or until it just comes to a simmer. Remove from the stovetop and add more honey or crushed red pepper to taste. Cool and store in the refrigerator for up to 1 month. Use to marinate meats, for basting BBQ chicken, for sloppy joes, in salad dressings, etc. This entry was posted in Central America, Condiment and tagged Barbeque Sauce, Belize, Belizean Barbeque. Bookmark the permalink. Best from Belize. Thank you – can’t wait to try it! Only the best from my country. Belizean to the bone.